The ‘Back to Black’ Tarmac Restorer from Go-Gum Limited, is a heavy duty, commercial quality, Tarmac paint and Asphalt refurbishment product, that not only re-colours faded and worn tarmac surfaces but also helps to greatly increase the life span of the surface. Totally Safe, Water based, Environmentally Friendly Tarmac paint. 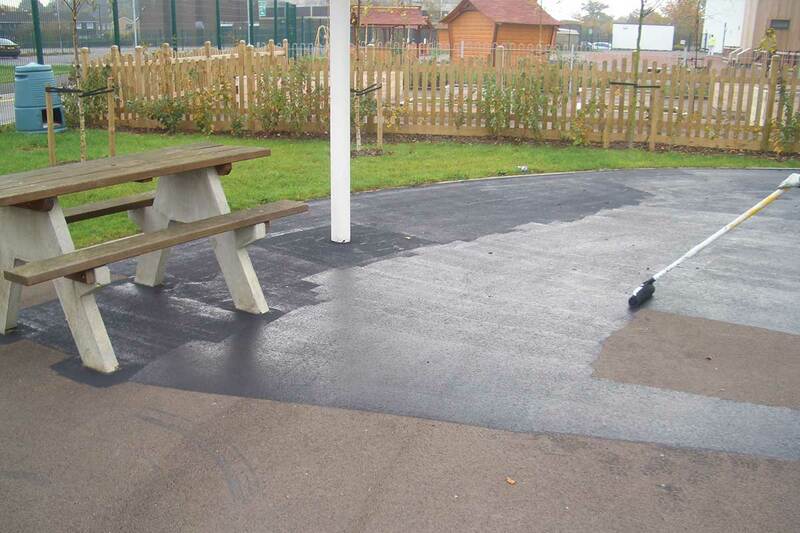 Perfect for Tarmac restoration in Public Areas, Car Parks and Playgrounds. We can Supply or Apply this AMAZING Tarmac resoration Product for you. Should you require a no obligation demonstration of the Back to Black Tarmac Restoration Paint please contact us on 020 7566 3988. We are happy to visit you at an agreed location in order to demonstrate the unique cleaning and protection solutions offered by Go-Gum limited. Back to Black Tarmac Restoration Paint cannot be purchased from our online shop. If you would like to place an order for Back to Black Tarmac Restoration Paint, please contact us directly via email info@getridofgum.com or telephone us on 0207 566 3988. Dramatically enhances the aesthetics of any existing Tarmac surface. Is a cost effective solution. Water based, environmentally friendly product. Will make unsightly Tarmac reinstatements less noticeable. Will provide a uniform coloured surface. Can be easily recoated at any time. Ideal to hide unsightly cement stains or marks after building works. The treated surface is easier to clean. Increases the life span of the Tarmac. Waterproofs and protects Tarmac areas. Resists oil, grease and dirt stains. Resists fungicidal and algae growth. Re-colour your Tarmac with black, red or green Tarmac coating. 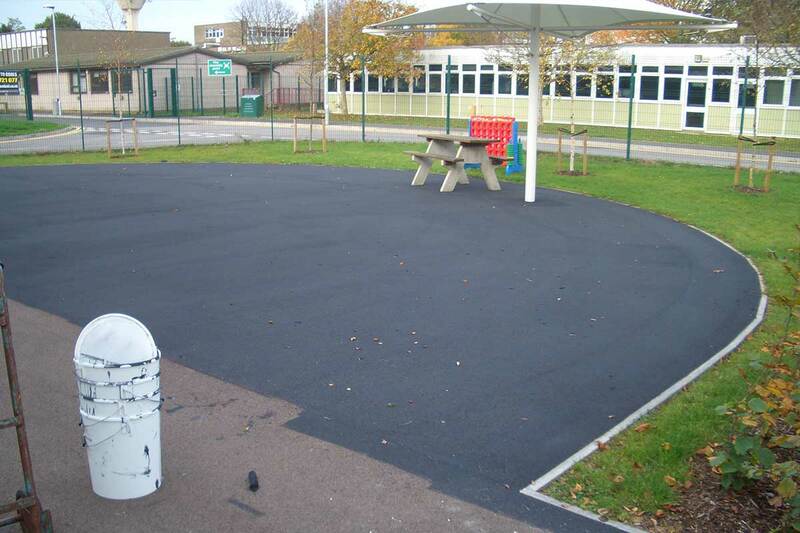 Tarmac Renovator can be applied to asphalt and tarmacadam surfaces, including pedestrian areas, forecourts, car parks, playgrounds, or any high traffic asphalt and tarmac area which requires renovation and protection! Thoroughly clean the area with a waterjet. Attend to any contaminated areas using degreaser or fungicidal wash as appropriate. Attend to any surface repairs using rapid set filler or cold tar. Allow for the area to dry thoroughly prior to application of Product. Cut in around the outer perimeter with a 4” brush or similar or use masking tape. Apply Product with a roller. Do not apply if rain is likely. Drying times will vary depending on the prevailing weather conditions. Stir the product well using a drill and paddle. Apply the product evenly to create a uniform surface coverage. Ensure the first coat uniformly colours the total surface area. Avoid pooling of the product. Avoid excess run off of product from the side of the roller. As this does occur, spread the product over adjacent areas. Avoid rolling continuous straight lines in the same direction. At all times, vary the direction of the roller in a random way. Always maintain a live edge of wet product to avoid overlap. Plan any stop / start points at inconspicuous areas. Once treated and allowed to dry, applying a less generous second coat will improve colour uniformity and improve wear characteristics. General colour variances will be created by uneven application and any colour variances will be more visible if the product was applied in the same direction. Varying surface textures will produce different colour effects despite product being applied evenly. i.e. smooth / closed surfaces will always look different to textured / open surfaces. If roller lines are visible it indicates that the product was not applied uniformly. If the product is not applied uniformly any variances will be more noticeable if roller application was always in the same direction. Avoid stopping the application in straight lines. Always feather out ‘live edges’.